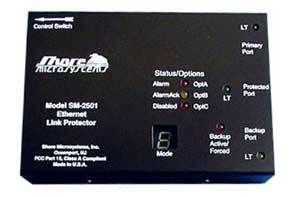 Shore Microsystems developed the first Link Protectors in 1996 when it became apparent to network managers that Ethernet Networks were becoming more and more mission critical to essential business operations with each passing day. Shore’s customers were risking potential large monetary losses due to the lack of built in network redundancy. Shore listened to our customers and the Link Protector® has become a staple for mission critical military and business Ethernet network links worldwide.